Wireless working has transformed the modern office. People are no longer chained to their desks. A laptop and Wi-Fi connection is all you need to be able to work anywhere. It’s made offices more productive and IT more cost effective to manage. Now this transformation is coming to the world of scanners too thanks to wireless technology. With the new i1190WN wireless network scanner you can share one scanner with many users. There are no cords or cables keeping it fixed in one place, which means you can easily move it around the office. It’s the perfect scanner for sharing and work collaborations. And it can handle everything from ID cards to complex business documents. You don’t need lots of expensive IT or powerful PCs to support it either, which saves you money. You can easily integrate it with your existing business applications and create new custom integrations. And you can even manage security levels and settings. Welcome to a new world of flexible, versatile, powerful, convenient and stress-free scanning. 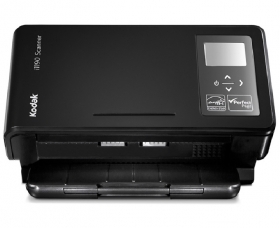 The new wireless and network Kodak i1190WN Scanner makes life a lot easier and more efficient for any business.